Everyone's favourite grey haired gang is back and thanks to our friends at Hopscotch, we've got 5x copies of RED 2 to give away on DVD! 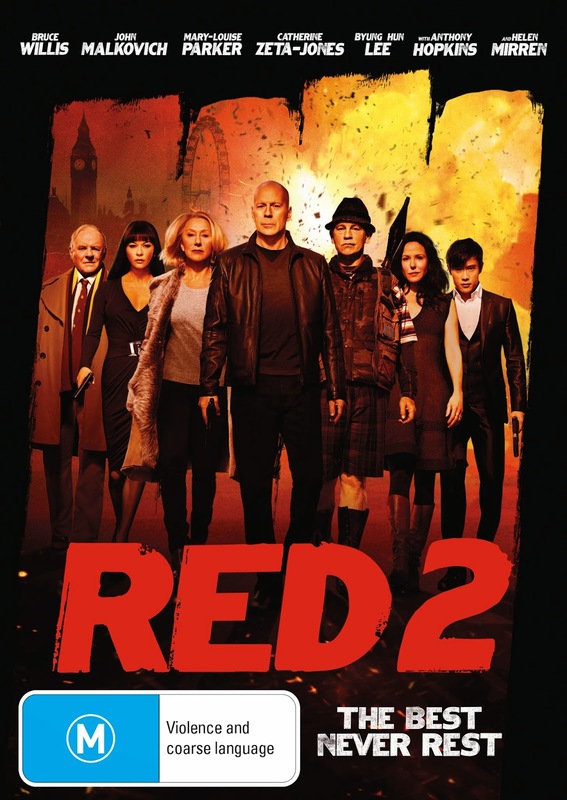 In Red 2, the high-octane action-comedy sequel to the worldwide sleeper hit, retired black-ops CIA agent Frank Moses (Bruce Willis) reunites his unlikely team of elite operatives - including former colleague Marvin (John Malkovich), ever-deadly sharp-shooter Victoria (Helen Mirren) and Frank's beloved Sarah (Mary-Louise Parker) - for a global quest to track down a missing portable nuclear device. To succeed, they'll need to survive an army of relentless assassins, ruthless terrorists and power-crazed government officials, all eager to get their hands on the next-generation weapon. It's a mission that takes them to Paris, London and Moscow, where they cross paths with Frank's seductive former flame Katja (Catherine Zeta-Jones), as well as Bailey (Anthony Hopkins), a brilliant scientist from Frank's past. Outgunned and outmanned, they have only their cunning wits, their old-school skills, and each other to rely on as they try to save the world-and stay alive in the process. Entries close 11:59pm on Sunday 19th January 2014. Your details will not be used in any way other than for the delivery of your prize. Geek of Oz and Hopscotch do not take any responsibility for the loss, damage or delay of/to prizes sent to winners (blame Australia Post for that one). The judges decision is final and no correspondence will be entered upon. One entry per person, subsequent entries will be void. Incorrect answers will be void. Prizes are not redeemable for cash or any other kind of trading currency such as creds, latinum, sen, kan, zeni, double dollars or Ankh Morpork dollars. Geek Of Oz take no responsibility for head explosions caused by utter awesomeness. This competition is only open to Australian residents. Any questions or queries can be submitted through the comment section at the bottom of screen. Good luck!